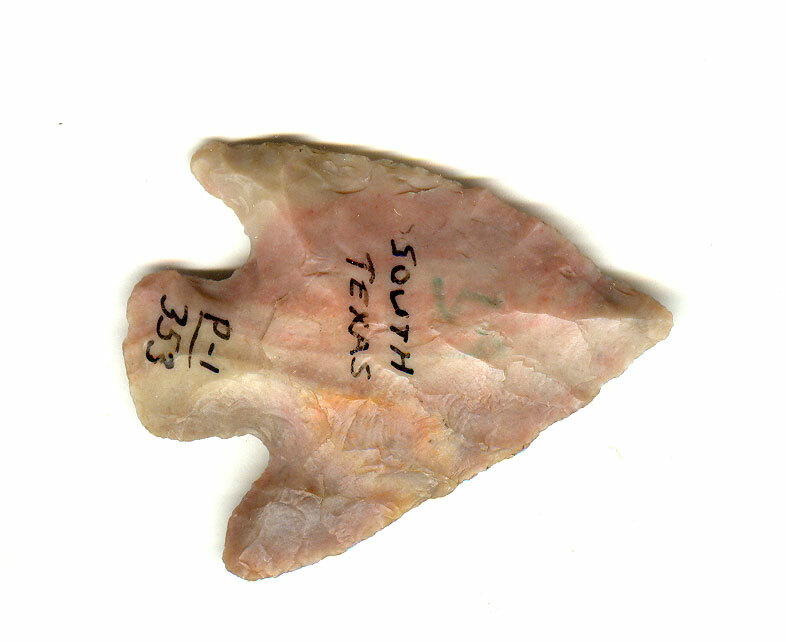 A Small Size, Colorful, Typically And Well Made, Overall Aged And Visibly Anciently Use Sharpened Shumla Point That Exhibits Stone Coloration Aging And Surface Patination, Aging In The Corner Notches, Polished Blade Hinge Use Wear, Correct Style Blade Flaking, Aged Surface Deposits, Correct Blade Sharpening Use Reduction, Correct Material And Manufacture For The Area Found. Ex-Gregory Perino, Si Sizemore And M. Russell Collections. The South Texas Writing Was By Gregory Perino And Si Sizemore Listed The Type As P-1, Referring To Perino Vol. 1 And 353 As The Page Type Is Shown.